Since White House Spokesman Jay Carney and most of the media can’t seem to bring themselves to do it, I thought I’d write a transcript for an honest press briefing. It’s a satirical look at this daily dance, which you can tell by the fact that most of the questions are ones that should be asked but never are. MR. CARNEY: Hello, everyone. Thanks for being here. I have no announcements to make, so let’s go straight to questions. Karl, go first. Q: Jay, if the president is, as Chief of Staff McDonough said, “madder than hell,” why did he wait so long to say anything about the VA scandal? He campaigned on being a champion for veterans, on fixing the VA, but he did nothing to address the problem. Why? MR. CARNEY: Karl, he has spoken about it continually. Just because it may have been in private, sometimes alone, doesn’t mean it didn’t happen. A tree falling in the woods does make a sound. As for the second part of your question, he’s doubled the budget for the VA. If that’s not caring I don’t know what is. I know I judged my parent’s love by the sum total of the money spent on my Christmas gifts, not whether they were what I wanted. Q: But there are systemic problems in the VA, problems he’s known about for years, and he’s done nothing to address them. MR. CARNEY: Again, Karl, I know you want to get into ‘who knew or did what, when?’ But now isn’t the time. The president is a Democrat. On top of that, he’s the first black president. You need to keep that in mind when you attempt the racism of holding him to the same standards as every previous President. Q: That doesn’t come close to answering my question. MR. CARNEY: Ed, why don’t we just get you out of the way now? Q: Um, ok. When did the President first hear about the allegations of deaths caused by excessive wait times at the Phoenix VA. Where was he? And what was his reaction? and where was he and what was his reaction? 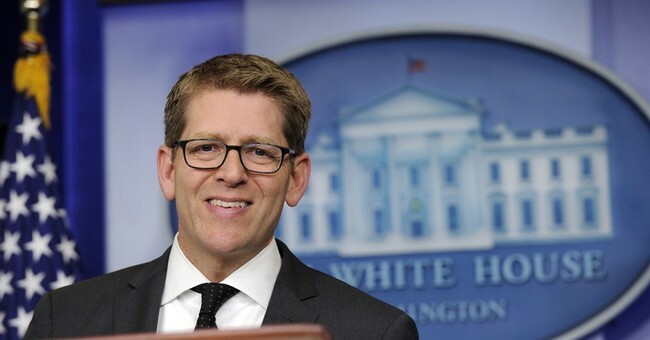 MR. CARNEY: Whenever the story first appeared on CNN, I don’t know what time it was. The president had a 10 a.m. tee time that day and he was on the 7th green when we called him – so however long it takes to play seven holes of golf. As for his reaction, I remember very clearly because he was on speakerphone. He was very angry because he said the ringing phone caused him to miss a 3-foot putt for par, and he demanded to know why we’d violated his “no calling during golf” rule. He then immediately demanded to know who was responsible for not setting his phone to vibrate because he wanted to fire them. We talked him down from that, then he told us to DVR the report and he’d try to watch it if he had any energy left after the fundraiser he was going to that night. Q: So he wanted for hold someone responsible for not putting his phone on vibrate but not for neglecting our veterans in the first place? MR. CARNEY: The point is he was informed as soon as we saw it on TV, Ed. Leave it to you to put your right-wing spin on it! MR. CARNEY: I’m done with your questions. Major, you’re next. Q: The president has nominated San Antonio Mayor Julian Castro to be the next Secretary of Housing and Urban Development. As mayor he has no real power or responsibility – the City Manager has all the authority. As such, Castro makes only $4,000 per year as “mayor.” So what about holding that ceremonial position qualifies him to be a cabinet secretary? MR. CARNEY: He was also a lawyer, makes a lot of money giving speeches and got a $127,500 advance to write a memoir, so he’s more than just a figurehead. Q: OK, then add that list of “jobs” to my question. MR. CARNEY: After giving a speech at the 2012 Democratic Convention, Mayor Castro became a very high-profile Hispanic in Democratic Party politics. Q: I know, but what qualifies him to be HUD Secretary? MR. CARNEY: Hispanics are an important voting bloc. Q: Right, but you’re not answering my question. MR. CARNEY: I have, you’re just not hearing it. Castro is extremely liberal and completely Hispanic. Whoever the 2016 Democratic nominee is, she will need a Hispanic to distract from the failures of the Obama administration. Since we don’t have any new ideas, and our old ideas are awful, we have to pander to our base. The black vote isn’t going anywhere. I mean, we’ve been crapping on them for 60 years, and we’re basically a rounding error away from 100 percent of their vote. Single women have been purchased with $9 per month worth of birth control pills. College students and recent graduates will vote for Democrats because we’re going to tell them how we want to help them with their massive student loans. And we have the people dependent on government vote locked down because what are they going to do, work? If we nail down Hispanics we’re gold. So, rather than find someone qualified to head HUD, why not use Castro as a shameless, race-based attempt to appeal to Hispanics? MR. CARNEY: It’s the truth. I know you’re not used to hearing it in this room, but there are so many lies I’ve had to keep track of that I’m simply out of brain space to add any more to the list, so I’m going with the truth. Next question is for whoever is here from NBC News. I don’t know who that is today, not that it matters. Q: Would you say that being in close physical proximity of Barack Obama so regularly is like ‘heaven’ or just the most awesome thing ever? And, as a follow-up, why are Republicans so racist? MR. CARNEY: Finally, some real journalism!